Shortly after moving into our new house we realized our master bathroom shower was leaking directly onto our electrical box... no bueno. We had two options, find the leak and repair the tile or take it down to the studs and start fresh. The existing bathroom wasn't our style and felt cramped with a stall shower and linen closet both with doors opening into the tiny space. The space had potential despite its small size so we went all in and ripped all of this out! and hex flooring, because I love it. I fell in love with this stormy blue lantern mosaic from Ann Sacks and the rest of the design all came together from there. 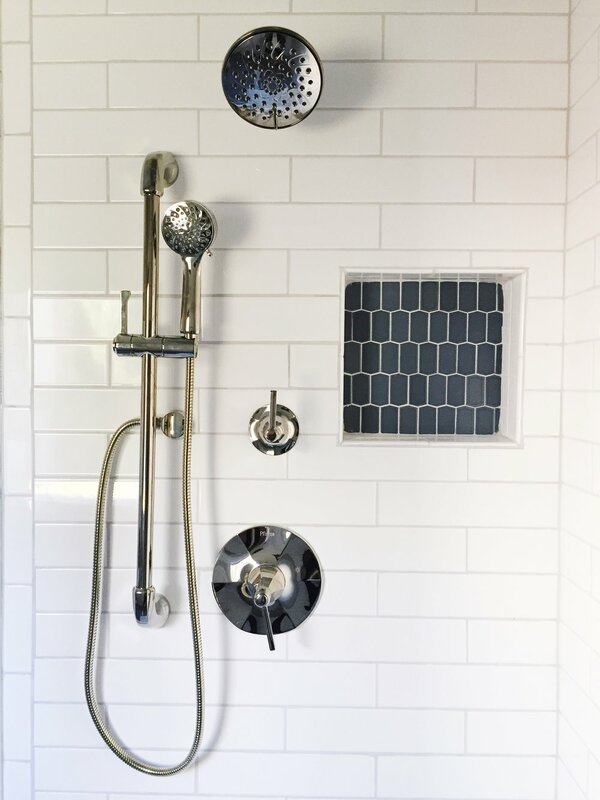 The space is grounded with a large textured hex tile in the main area and the grey transitions into the shower floor with a gorgeous penny tile and the perfect white granite with grey striations for the sill and shower seat. 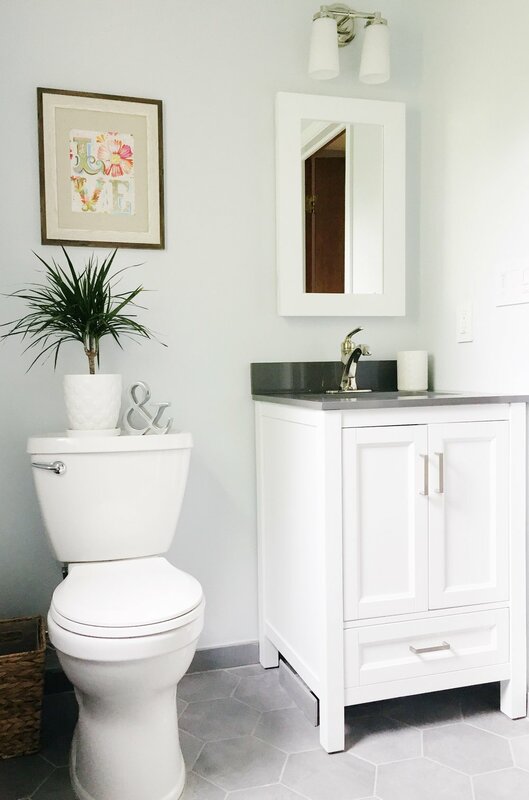 Classic white subway tile and faceted polished nickel fixtures are timeless details that also brighten the space with their reflective nature. Walls painted in the faintest shade of blue (Sherwin Williams Quicksilver) make this the most refreshing place to start my day. The vanity was a great find and saved us from having to go the custom route. It has enough counter space for a flatiron (yes, I thought about that! ), soap, and toothbrushes. The skinny drawer on the bottom is essential for staying organized, and the contrasting top gives it some character. And last but not least, our must have recessed medicine cabinet. Beautiful hidden storage for makeup, brushes, and everyday essentials that I don't want cluttering up our new space. And voila! We now have a beautiful master retreat that makes my heart happy. Everyone deserves a master bath that feels like a private oasis, no matter what kind of space constraints there are. What would be on the must have list for your master bathroom?! A rain shower, a double vanity, or maybe even heated flooring... the list could go on and on! Share in the comments below or contact me if you're ready to make your master bathroom dreams come true!